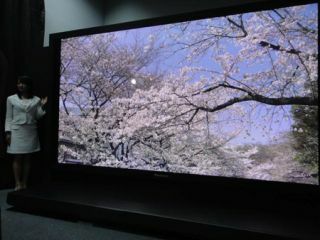 Panasonic and NHK unveil world's largest 8K plasma display | What Hi-Fi? We've seen one or two 4K projectors recently, but now Panasonic and NHK have taken things to a whole new level by jointly creating a giant 145in 8K plasma display. Known as Super Hi-Vision in Japan, resolution is 7680 x 4320 – that's sixteen times the resolution of standard 1080p Full HD – and it's said to be not only the world's largest, but also the first self-illuminating 8K screen. Having already worked on smaller (well, 103in!) 4K screens, the two companies had to develop an entirely new drive method for the display that works by scanning the pixels vertically to create uniform picture quality. The BBC is planning to film some of the London Olympics in Super Hi-Vision. Designed as a showcase product, don't expect to see this particular 8K screen in your local high street electrical emporium just yet.